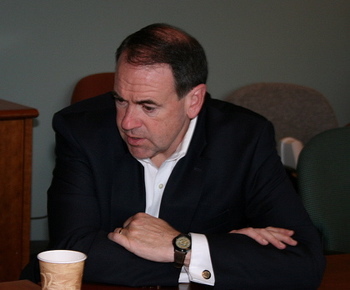 Former Arkansas governor and GOP presidential hopeful Mike Huckabee was in Seattle last Thursday promoting music education for Music Aid Northwest after speaking to a meeting of the Family Research Council. Between making the rounds on local rock and conservative radio stations, he sat down with Will Mari and Laura Mansfield, SeattlePoliticore.org writers and OffTheBus members, for a wide-ranging interview. He talked in part about how the Web has transformed politics, moving power out of the hands of the wealthy, how Fred Thompson killed his candidacy, how South Carolina was the turning point, how Republican ideology has been hijacked by a new-style fiscally irresponsible and un-American version of libertarianism and how the evangelical vote is up for grabs this fall. Here's a partial, summarized transcript of the Q&A. How are you doing after the election and the primary season? Almost as busy as I was during the campaign [doing a lot of speaking on behalf of candidates for the House and Senate and for Sen. John McCain]. Then also, [I have] been working on my future, on what I'm going to do, and some of that involves writing a book that will come out in November." I have to kind of keep it very general. The publisher wants me to keep things very mysterious for now, but essentially it'll be a book on the overall direction of American and where it's headed.... I'm also looking at some media opportunities that I'm trying to nail down ... I'm certainly not lacking for something to do." Why do you believe you lost to John McCain, other than money? He got more votes than me! If you do an analysis of the election, if we had played by the rules of the Democrats, I would have won, and if the Democrats have played by the rules of the Republicans, Hillary would have won this long ago. But those were all proportionate states. So I won them, but I didn't get all the delegates. But if you had taken that whole system and reversed it, it would have been a very different outcome. [Even after winning New Hampshire, McCain] had said that if he lost South Carolina, he was quitting. Instead, he won South Carolina, and so he goes on to get the nomination. We barely missed it in South Carolina and then we had some conservative talk show hosts that kept saying we were pulling out of Florida, which was not true. I was in Florida every day, and that hurt us... We never could recover because by that point the media had already decided how the outcome was, and you couldn't overcome it. We knew there was still a chance, but the problem was, it was a perception issue we had to overcome. It's not unlike what Hillary's facing today. Whether she likes it or not, the perception is that it's over for her. She can argue that she could take it to the convention. I could argue the same thing. The convention is where the process really does happen. But once every day, the media pounds it in that the elections over, then at some point it becomes this self-fulfilling prophecy... if every day for weeks on end, the people of Ohio or Wisconsin or Texas or Rhode Island are told that it really doesn't matter how they vote, it's already done, then first of all, some of the people just don't even bother to go vote, and others don't want to vote if they don't think they're going to win, so they go vote for whoever everybody says is going to be the winner. There's just a certain psychology about that. What do you think is going to happen to those new voters? Are they going to go for McCain in the fall? "I hope they'll go for McCain. Obviously, I'm going to do everything I can to get them there, but because they're new, I think sometimes there is some discouragement with them. I do most believe most of them got involved with me because of the things that I believed in and [my] principles. And when they look at the field, they'll know that John McCain is far, far closer to where they are than either Hillary or Obama. What can people like yourself do to overcome these sorts of media narratives? Direct to the consumer. The great thing about the Internet is, the best way we found to counter the nonsense we dealt with was to put on our own website the truth... [We had nearly 600 dedicated volunteer bloggers writing for the campaign.] We'd turn those bloggers loose, and they'd fill up cyberspace and go to town. People wondered how did we get where we did. We had a tenth of the money these other guys had. We were spending a dime to their dollar. What they never understood, though, was that we had more web hits to our site than Barack Obama, than Hillary Clinton, than John McCain, Rudy Giuliani, than Mitt Romney. We were far and away the most-hit website out there on the political campaign, and we created, in essence, an online community that became the backbone of our entire campaign and candidacy. The great thing is, [the internet] is changing the face of politics, the traditional and conventional wisdom, and the one I went up against like a buzz saw was this 'money equals viability' [argument]. If money were the criteria by which a person was the nominee, Mitt Romney would definitely be the nominee. But no matter how much money Romney spent, and we'll never know, it's an incalculable amount of money probably. When it got down to it, he could spend 10 times what we spent, in Iowa, nearly 20 times what we spent, but people weren't buying it, and frankly that's a good thing to see, that you cannot purchase the White House. What do you think is going to happen with the evangelical vote in the fall? Secondly, John McCain has got to be very clear and talking to the evangelicals, and beyond the evangelicals, it's really a broader base than that, the Catholics, and the social conservatives, not all of whom are ... evangelicals but who really do firmly believe in some issues. If a candidate can't and won't articulate clearly to them, [they] won't necessarily be counted on. Do you think Obama is an evangelical? I don't know that I would call him an evangelical, but I think he's certainly a Christian, he openly declares his Christian faith, and I think some Republicans who try to dismiss that are making a big mistake, and they'll be very naïve if they think they can just assume that all of the faith vote is going to automatically go Republican this year. It is not. A lot if polls are showing that there are a number of evangelical white voters who are willing to go shopping this fall. They're not necessarily just sold. [Look at the special election in Mississippi, where Republican Greg Davis lost to Democrat Travis Childers.] That was a very, very telling election. The Democrat ran as a pro-life, pro-family, conservative Democrat. The Republican painted his opponent as a liberal and ran on economic issues alone. He ran a good campaign -- he is pro-life -- but he didn't focus on that. He focused more on "my opponent is a liberal" ... and people we're looking at this Democrat and they're saying, "Well, he's pro-life, he's pro-gun, he's pro-God, that's not 'liberal." And so it hurt the credibility of the Republican and the Democrats are winning all over the country. [The Democrats have recruited] "middle-of-the-road, right-of-center Democrats. They're going after people that don't scare the daylights out of traditional conservative people, and they're running on the very platforms that the Republicans have had to themselves for the past 20 years It's a wake-up call to Republicans. Where we're making a mistake is a lot of Republicans are saying "we don't want to talk about these family issues anymore." Well, guess what? You're going to keep getting beat, because that's what got these people voting for you. Twenty years ago, these were Democrats who went Republican when the Democrats made a sharp left turn, and the Republicans were the only place pro-life people could be. Now the Democrats are beginning to come back to [the] center, and the Republicans are becoming libertarians. We're losing elections in a grand way. What can the party do to reverse course? If you have a breakdown in the social structure of a community, it's going to result in a more costly government ... police on the streets, prison beds, court costs, alcohol abuse centers, domestic violence shelters, all are very expensive. What's the answer to that? Cut them out? Well, the libertarians say "yes, we shouldn't be funding that stuff." But what you've done then is exacerbate a serious problem in your community. You can take the cops off the streets and just quit funding prison beds. Are your neighborhoods safer? Is it a better place to live? The net result is you have now a bigger problem than you had before. My experience in Arkansas was, a lot of the so-called conservatives said "Let's cut the budget." But they wanted to add prison sentences, they wanted to eliminate parole, they wanted to have harsher sentences for various crimes. And I said "OK, that's fine, but that's going to be expensive. So which do you want?" You can't have both, or you do what the federal government has done, and this is where I think Republicans have been especially irresponsible. Their approach has been [to] just kick the can down the road and let your grandkids pay for it. So they run up huge deficits ... but they've pushed those costs down to the states, and the states have to eat it, because they have to balance their budgets, they don't get to print money or borrow. Or the federal government just runs up more deficits and let's the next couple of generations worry about paying for all this stuff. Either way, it's irresponsible, and I think people in America are smarter than that and they know that's not the responsible way to approach governing.